The Club Enclosure allows racegoers access to the Ramshaw Stand and all areas providing excellent viewing of the parade ring, racecourse and winners enclosure. Situated on the ground floor of the Ramshaw Stand, the Chase Bar features an attractive stone-flagged floor and beautiful stained-glass panels on the bar. Refreshments and betting facilities are available, along with extensive TV screens. Situated on the first floor of the Ramshaw Stand, the Curlew Room provides a relaxing bar experience with a thick pile carpet and fantastic views of the Racecourse from the comfort of your seat (please note tables cannot be reserved). This bar offers drinks and hot snacks as well as facilities for betting and extensive TV screens. 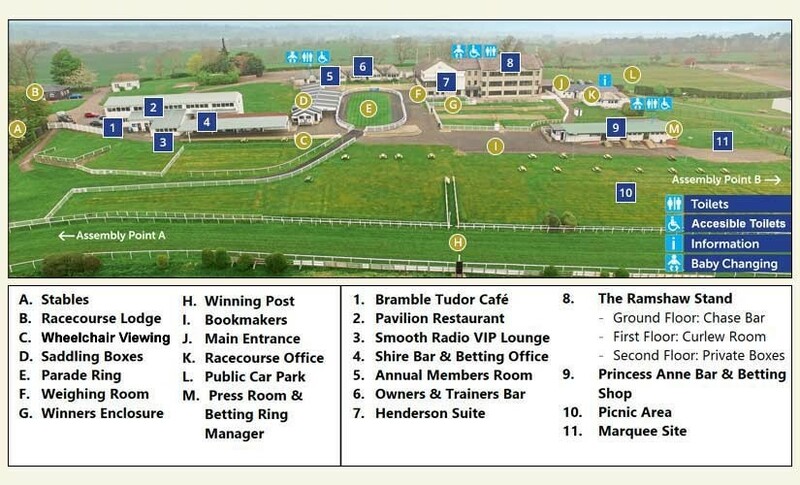 The Paddock Enclosure, with easy access to bars, food outlets, bookmakers, betting shop, parade ring and saddling boxes together with excellent viewing of the racecourse. Located at the East side of the Racecourse complex, the Princess Anne Bar offers a variety of drinks and snacks. There is a large betting office and TV screens. Located towards the West side of the Racecourse complex, the Shire Bar offers a variety of drinks and hot snacks. There are also betting facilities available and TV screens. Located at the West end of the racecourse complex next to the Owners & Trainers Entrance, the Bramble Tudor Café has a large seating area with TV screens and offering a variety of sandwiches, snacks and soft drinks. There are parking spaces for disabled persons situated on the tarmac area to the rear of the Owners & Trainers Bar and Henderson Suite. 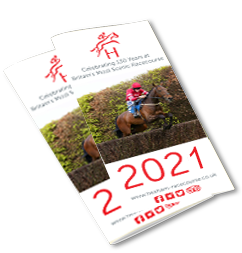 Accessible toilets can be found in the toilet blocks at the top of the Parade Ring and behind the Princess Anne Bar. There is a lift in the Ramshaw Stand from ground to second floor with accessible toilets located on the first floor.